Bitcoin, the world’s first and most popular cryptocurrency, celebrates its 10th birthday Wednesday. It all started Oct. 31, 2008, with a white paper (report giving information or proposals) published by an unknown person or group of people using the name Satoshi Nakamoto. The white paper titled “Bitcoin: A Peer-to-Peer Electronic Cash System,” was a nine-page document. It was posted as a link to a cryptography mail list, and has become the bible on how bitcoin operates today. The paper detailed the use of a peer-to-peer network (a distributed application architecture that partitions tasks or workloads between peers) to allow online payments to be sent from one party to another without depending on a financial institution. All such transactions are broadcast across the entire network, but users' privacy is maintained by keeping their bitcoin addresses anonymous. The first commercial transaction using bitcoin was made in May 2010 by Laszlo Hanyecz, a Florida-based programmer, who spent 10,000 Bitcoin on two Papa John’s pizzas. At today’s rate, 10,000 Bitcoin is worth $62 million -- it was just $0.008 in 2010. Bitcoin, with a market capitalization of approximately $109 billion today, is regarded by many to be one of the most successful currencies ever created. Its rise since launch in 2009 left billions up for grabs for virtually anyone, so it was natural that the game-changing cryptocurrency produced a distinct field of millionaires. We bring you the stories of five such early bitcoin investors. Jeremy Gardner, a 25- year old crypto millionaire, purchased bitcoin in 2013 in exchange for cash when a friend offered the deal. Gardner explained: "I never thought about bitcoin or the greater subset of crypto assets as a financial investment— it was and is a life cause." Gardner explained how he bet everything that he earned from bitcoin into his startup called Augur. "Now obviously, like anyone who dedicates their life to something, I dedicated my resources, including my money, into this new technology. But the first money I put into was into my startup, Augur, in which I bet everything. When that bet paid off, I diversified into more crypto assets because I believed so much in the technology. But at no point did I believe or expect this to be an investment that would pay off so immediately. I was just young and dumb and had the conviction to go all in on this new investment class," Gardner told International Business Times. He said that it's important for the investors to educate themselves on this technology. Among the other famous bitcoin rich are the Winklevoss Twins. Tyler and Cameron Winklevoss are currently worth around $900 million to $1.1 billion each. In March, 2013, they together bought about 100,000 bitcoin, when the coin was worth roughly $120. Today 100,000 bitcoin is worth about $625 million. 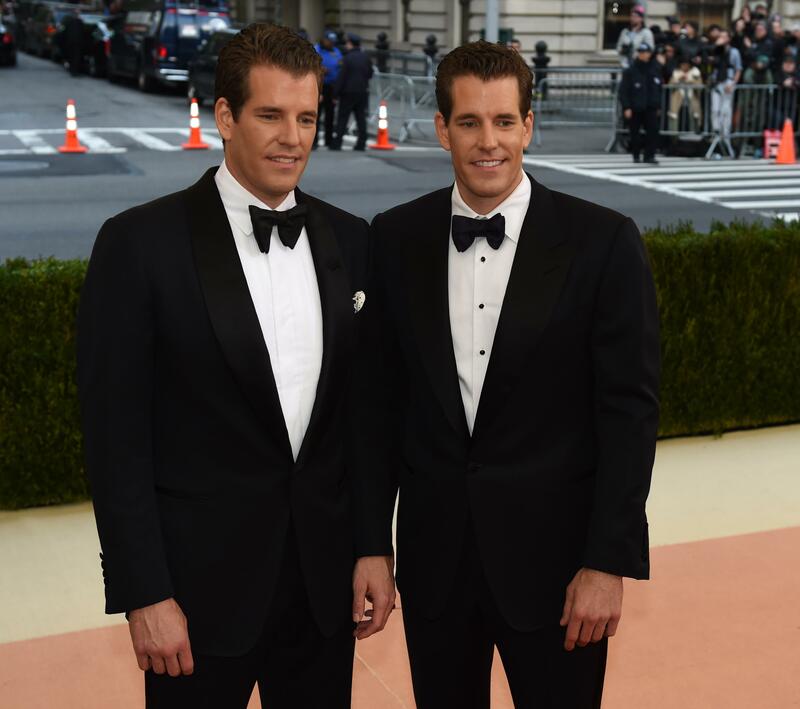 The twins are famously called "the world’s first bitcoin billionaires." Tyler and Cameron Winklevoss famously called "the world’s first bitcoin billionaires" are currently worth around $900 million to $1.1 billion each. Here, the Winklevoss twins arrive for the Costume Institute Benefit at The Metropolitan Museum of Art in New York, May 2, 2016. Photo: TIMOTHY A. CLARY/AFP/Getty Images In 2004, the two brothers charged Facebook for stealing their idea and then settled for roughly $65 million worth of stock and cash. In 2012, they decided to begin investing in bitcoin for the first time and led seed funding of BitInstant, a bitcoin payment processor, with $1.5 million. However, in January, 2014, Charlie Shrem, CEO of BitInstant, was arrested and indicted for money laundering following which the brothers said they were just passive investors in the company. The twins also started a bitcoin exchange called Gemini in October, 2015. Erik Finman, although is not the richest cryptocurrency holder, is famous as the youngest person who became rich after investing in bitcoin. Finman, who is 19 years old now, began investing in bitcoin in 2011 (when he was 12 years old) after receiving a $1,000 gift from his grandmother. Finman says investing in digital currencies is one of the best and fastest ways for young people to raise large amounts of money. He said in one of the Twitter posts: "Cryptocurrency is more than just a way to get rich. It’s an idea that gives hope to the powerless. It represents the largest transfer of wealth our generation has ever seen. It tells us that no opponent is too great to beat if you’re willing to go all in." Kingsley Advani, another bitcoin investor, created a fortune in 2017 by selling all his possessions — laptop, headphones — and emptying his savings accounts, to gather $34,000 which he then invested in bitcoin. With bitcoin's surprising price spike in 2017, his investments became a “low seven-figure” sum in just six months. Advani worked at a software firm and every month would put all of his salary into cryptocurrencies. In October last year, Kingsley quit his job and decided to travel the world. He is now an “adviser and angel investor” who has investments in cryptocurrencies like zilliqa, aion, wanchain, qlink, deepbrain, along with ethereum and NEO. Ian Balina became well known on Twitter in 2017 through the screenshots of his Blockfolio app (free bitcoin portfolio management app) which outlined the rise in his investment from just $100 to approximately $6 million in 2017 when bitcoin's price was at its peak. Balina produced the gains by employing an approach called “money ball” to invest in initial coin offerings, which he kept a public record of in a Google docs spreadsheet. In his spreadsheet, he posted the ICOs he invested in along with ones he did not invest in. He allocated points to the ICOs based on whether they had a development team, advisers, and a working prototype. He now travels around the world advising new ICOs and conducting meetups with his fans, posting updates on his Twitter account along the way. Bitcoin A Better Currency Than Dollar?